You can hardly critique a guy who nailed the first-ever interview with the world’s most wanted drug lord. Yet, critique Sean Penn we did. Sean Penn, if you remember, is an actor … an actor who, no matter how hard he tries (even after winning two Academy Awards for Best Actor), will never quite shake his most memorable role: stoned surfer Jeff Spicoli in Fast Times at Ridgemont High. Mr. Penn is also a filmmaker, political activist, and he can now add journalist to his bio since penning a 10,000-word article about his secret meeting with Joaquín Guzmán Loera (known as El Chapo). But, “Not so fast,” say professional journalists. Is Sean Penn someone we can trust? Shortly after Rolling Stone published the article at midnight on Saturday, January 9, 2016, journalists from Dallas to New York have been picking the interview apart. Sonia Simone and Stefanie Flaxman even weighed in on the discussion on Copyblogger.FM. One of the most notable and useful critiques that Sonia and Stefanie discussed comes from Kelly McBride, media ethicist and Poynter’s Vice President for Academic Programs. Interestingly enough, though, McBride argues that the article’s journalistic failures should not rest on Penn’s shoulders. She blames Rolling Stone’s editors. You and I will probably never be in a position to interview the world’s most notorious villain, but McBride’s suggestions for what should have happened are pretty darn useful for anyone in the content marketing game. Which is why we put together 10 rules for writing content people can trust based upon McBride’s advice and a few lessons we continually teach on Copyblogger. Because whether you are a journalist or content marketer, you must build trust with your audience. Keep the following 10 rules close to your vest when you create content, and don’t forget to check out our SlideShare presentation of the 10 rules at the end of the article. According to McBride, this was the most glaring problem with Penn’s article. And it’s a critical lesson to learn. Interview experts, seek outside sources, (even if they are from a book), and talk to significant stakeholders on a subject to communicate a complete, comprehensive story. When I wrote my native advertising series, I included relevant people in the discussion: publishers, agencies, and — most importantly — readers. Your job is to shape the voices of your outside sources into a meaningful, coherent, objective argument. All scammers are Nigerian princes with large families. Cats are not impressed with cupcakes. Here’s the thing: we all have assumptions, and some of them could even be true. But keep in mind that any time you wander into absolutes (always, never, all, etc. ), question the accuracy of your statement. Provide the results of experiments, observations, research, and tests. Not just anecdotes and testimonials. Yes, anecdotes and testimonials are important, but they are not enough. You need empirical data. Instead, drum up a hypothesis, and then discover if your theory is true through existing research or your own. And, of course, don’t be afraid to admit you are wrong if that’s what you discover (see Rule 10). Want to learn more about data and theory? Read Gary Smith’s Standard Deviations. We also break trust with our readers when we forget that we probably know more than our audience. For example, when I tell readers to “bone up on your customers’ emotive capital if you want more sales,” they have every right to wonder if I was all messed up on cough syrup. To them, I’m speaking a foreign language, which I actually am because of an information imbalance: I have more of it than them. See, each word in that slogan I slung out is thick with meaning, history, and experience — to me. To them, however, it’s nonsense. And this is called the “curse of knowledge,” which leads to confusion on the audience’s part and frustration on yours. Fortunately, you can avoid the “curse of knowledge” by using clear language, telling stories, and assuming nothing about your audience. You are the reader’s advocate, so it behooves you to hold your sources accountable so that you produce accurate content. Don’t fall in love with a source and fail to challenge his assertions, assumptions, and claims. James Altucher’s podcast is a great example. He has no allegiance to his subjects — only to his listeners. Which can make his interviews contentious, but charming. His listeners feel like James has their back — not the subject’s. The lesson for you: never forget where your loyalties lie. In the same vein as the rule above, if you are the reader’s advocate, put yourself in their shoes when creating content. What questions would they ask the sources? What objections are they going to raise on this topic? Anticipating these questions will make them feel like you are listening to them — that you have their back. When you answer these questions before they’re asked, your audience members will feel like you understand them. And if you don’t have an answer to a question yet, perform research and write new content or record a new podcast episode on the topic to serve your audience well. Inform readers of the circumstances surrounding an event or topic, and paint a complete picture by linking to appropriate articles or sources in your content. The controversy surrounding Penn’s interview inspired this piece of content, so I explained that in the introduction of this article. Since you’re a content marketer, there are relevant lessons from this event for you to learn and incorporate into your own work. The Penn interview is so irresistible because it’s one of a kind. Which is why some journalists were willing to overlook the editorial mistakes. They argued that the interview moved the story forward. You could also say Penn avoided the obvious. He tackled an original idea, which is in line with Google’s standards for high-quality content. Avoiding the obvious is also another way to deal with so-called content shock. You need to resist publishing content until you land a unique angle — and can move the conversation forward. You can’t do this unless you are intimately aware of who’s publishing what. So, you must do your research before, during, and after you publish to ensure you’re not saying the same thing as everyone else. Would you expect to see your article in a printed magazine, encyclopedia, or book? If you can’t say “yes” to that, then don’t publish until you can. It really all boils down to this. If you want people to trust you — if you want to build authority — and dissolve your readers’ skepticism, then act against your own self-interest. When you have an obvious agenda, people take what you say with a grain of salt. It’s like a mother saying her boy is the smartest child on the block. Dissolve your readers’ skepticism by pointing out your own weaknesses, inviting people with competing opinions to the discussion, and keeping your emotions in check. Furthermore, tone down your confidence about your abilities and convictions. In other words, humble yourself. By the way, drop me some comments if you agree or disagree with anything I wrote. Also, do me a favor and tell me your favorite Sean Penn movie. I think you know mine. Can’t wait to hear yours. See ya, bud. Excellent post Demian, I think, statistical data to prove your theory is the main point where you can turn your reader’s trust or thought process towards you. Sometimes people trust only those theories which they actually want to listen. If you are writing something differ than their expectations then you need a strong database to prove your theory. Excellent point, Deepak, and thank you for the kind words. Hey Demian, I couldn’t help but notice that your site has a page rank of 7! That is so freaking cool! I recently started a blog and have been trying to write high quality articles to build a feeling of trust as well as loyalty amongst my visitors/readers. I don’t need someone to prove to me how wonderful or great they are. What I need them to do is relate to me in from that is relevant and compelling. When we have solid data that we can use to support our “theory” we demonstrate competency and that is the first step in developing trust. At the same time, I’ve seen a lot of content that is so heavy on knowledge and industry language that I have no idea what that person is trying to communicate. It’s as if they are trying to impress me instead of just communicate with me. When we create content that is over someone’s head we actually violate trust. I appreciate your insights and thanks for asking me to pause, reflect and proactively communicate to the consumers of my content what they need over what I want to tell them. Have an awesome week Demian! Some people (and I’ve been guilty of this) think they can look smart if they use big words, trot out studies, hang their copy with jargon. Like you said, be clear and personal is more important. There is a time for evidence. And their is a time for fun. It is very impressive read. Writing controversial content is always helpful as it brings attention as well as get readers comment on what you say. Data driven content on the other hand keeps a reader interested in the content you write! 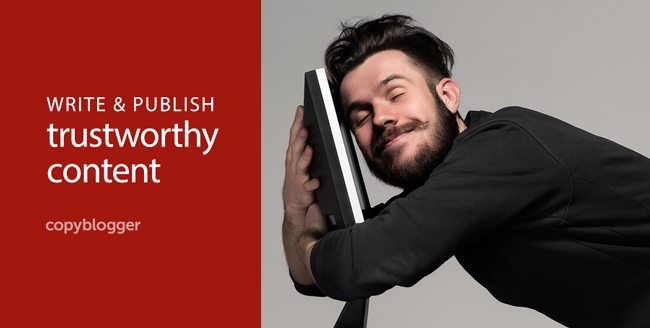 Another great read in copyblogger. I gathered much useful info here and thanks for always enlightening the minds of the writers. I have been writing for many years but still struggling since English is only my second language. So, copyblogger is a great tool for me. Glad to hear from you, Felisa, and glad we could help. Build trust with the audience should be the goal for anyone out there working with internet marketing but mostly with any other niche as well. Maybe some people will try to build trust only to make money, something like a fake trust, a mask …. I don’t even need to say that anyone should avoid it, build real trust and be honest to your audience, that’s everything for you. Sell the problem you solve, not the actual product. The Secret Life of Walter Mitty ~ Sean Penn’s character is fantastic in this. There is one scene in particular when he admits the poorly thought out idea that drives Walter to chase him. I absolutely love it. Also this article is very helpful when it comes to humbling myself. As I begin my career it is very difficult to gain trust as a younger person in the infancy of their career, but it can be done. I really appreciate the tips. What comes to mind when you think of the beginning of your career? Just curious. I need to watch that movie. I’ve heard nothing but good things about it, but didn’t realize Penn was in it. What comes to mind when I think about the beginning of my career? I think it was get filthy rich. Then as I aged I realized I wasn’t motivated by money nearly as much as I thought I was. So many good points. This is going in my file of content writing guides. Sometimes I struggle to write content that I feel is worthy of publishing. Although there are a lot of gems in this article, “land a unique angle and move the conversation forward” is the one that really hit home. That is such a key in creating something more interesting than regurgitated blog fodder. That one piece of advice really helped me break through a block I was having in making my content sound like a publishable article and not a $5 SEO article. I’m gonna try this. Thanks! It is key, and it’s hard work digging for that unique angle. But when you find it, it will be worth it. Thanks for commenting Ian. I too am filing this article away for future reference. I found several golden nuggets in here that I’m going to implement, and couldn’t agree more with item number 10, particularly with ‘inviting people with competing opinions into the discussion.’ I wholeheartedly agree with doing this while at the same time stating in your own terms that your position may be what it is today based upon personal experiences but is subject to evolve as you hear from and consider what others have to say on the topic. This list is definitely a keeper. My favorite on the list is #8 Provide Context. The list also put me in mind of a conversation I listened to between the founders of StoryCorps and Humans of New York – https://storycorps.me/interviews/brandon-stanton-and-dave-isay/. I’m passionate about great storytelling, and this interview was a goldmine of insights. I was particularly intrigued by HONY’s Brandon Stanton’s assertion that he is trying to get good at asking questions, not at trying to figure out overarching generalities about humanity, because to do the latter would limit his questioning – it’s about the process, not the outcome. I love that commitment to approach each conversation with no other agenda than to learn, and to make a connection. Regarding favorite Sean Penn movies – Secret Life of Walter Mitty, for sure. The scenes set in Iceland were my favorites. You are the second person to vote for Walter Mitty. I definitely need to watch it now. Love Brandon’s approach. A lot of truth to it. It’s like being curious for curious’ sake. Which I love. Every time I sit to eat lunch, I take out my phone just to check out the latest Copyblogger post (instead of listening to music or watching a movie). And this one was just as yummy! Out of all the points, #9 really hit me. Then after my second read, it was #6, then #10, then #2, then…oh boy! But really, finding that unique angle is super important. With the growing number of blog posts everyday, sometimes I feel like I’m drowning. It’s hard finding an original idea because it seems like something about almost everything has already been published online. We could all start that quest of being original again by listening to that podcast episode. And as a Nigerian, I’d say not all scammers are Nigerian princes with large families :). Definitely sharing this post. And the link is going straight into Evernote. Keep up the good work Demian! Lanre, thanks for the great comment, and keeping me straight on scammers. That is the right podcast episode. It’s funny how we forget what we’ve done in the past, so it was good to be reminded of the “what if?” idea again. Thanks for listening and reading. Everytime I visit CopyBlogger, it helps me to learn something new. In last two years, I learn lot from this blog. It takes me around two hours to read the whole post. My favorite on the list is #5 Avoid the curse of knowledge. Thanks for the awesome share. Thanks for investing that kind of time into reading! I don’t need to go somewhere, when I face any problems regarding the blogging or Content Strategy then I visit here and I get every thing what i want. Bad Boys (in 1983), is my favorite Sean Penn movie. But Fast Times At Ridgemont High is a close second.